DIWALI "is an important five-day festival in Hinduism, Sikhism andJainism, occurring between mid-October and mid-November. Diwali marks the end of the harvest season in most of India and Nepal. Farmers give thanks for the bounty of the year gone by, and pray for a good harvest for the year to come." "In Britain, Hindus and Sikhs celebrate Diwali with great enthusiasm and in most ways very similarly to as in India. People clean and decorate their homes with lamps and candles. A popular type of candle used to represent this holiday is a diya. People also give each other sweets such as laddoo and barfi, and the different communities may gather from around the country for a religious ceremony and get-together. Leicester plays hosts to some of the biggest celebrations outside of India itself. Diwali also coincides closely enough with the British Guy Fawkes (Bonfire Night) traditions on November the 5th that in many areas, such as the East End of London, a kind of joint festival has evolved where everyone celebrates and enjoys the same fire and fireworks for their own diverse reasons." 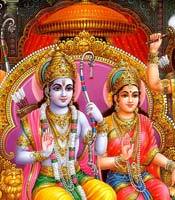 "The original Ramayana story had 50,000 verses to it. You can read a much shorter version of it here..."
"Different colorful varieties of fireworks are always associated with this festival. On this auspicious day, people light up diyas and candles all around their house. They perform Laxmi Puja in the evening and seek divine blessings of Goddess of Wealth. The festival od Diwali is never complete without exchange of gifts. People present diwali gifts to all near and dear ones." The Festival of Diwali : "Neelu, 10, lives in India and talks about what goes on during the festival of Diwali." Diwali, the Hindu festival of lights, "is the most popular of all the festivals from South Asia, and is also the occasion for celebrations by Jains and Sikhs as well as Hindus." Diwali - " The festival celebrates the victory of good over evil, light over darkness and knowledge over ignorance, although the actual legends that go with the festival are different in different parts of India." The Story of Diwali - A description of the five days of this festival. "Festivity is in the air as Jaipur gears up for this most important of all Hindu festivals. The annual house-cleaning done (Diwali's a great time to find misplaced things! ), the city seems to be on a shopping spree." Why isn't Diwali celebrated on the same date each year? 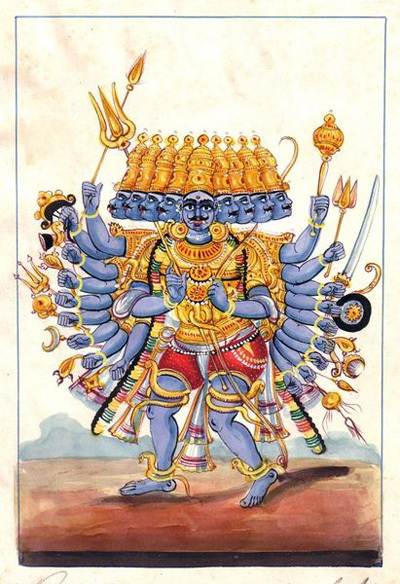 What is the story of King Rama and the demon Ravana? "In Hinduism, Goddess Durga is regarded as the mother of the universe, and believed to be the power behind the work of creation, preservation, and destruction of the world." "Diwali, the Hindu festival of lights, celebrates the victory of good over evil and the triumphant return of Lord Ram to the city of Ayodha after vanquishing Ravana in the kingdom of Lanka." "Indians are celebrating Diwali, the biggest Hindu festival, by lighting earthen lamps, bursting firecrackers and distributing sweets." Si le lien est inaccessible, cliquer sur "GEOGRAPHY RESOURCES / Around the World"
Si le lien est inaccessible, cliquer sur "R.E. RESOURCES / Hinduism"
"During Diwali, Hindus draw bright Rangoli patterns on the floor by the front door to encourage the goddess Lakshmi to enter their homes." "Interactive activities for whiteboard or computer on the story of Rama and Sita and how Hindus celebrate Diwali today. Activities are differentiated at various levels. They include an electronic version of the story, discussion topics on the meaning of Diwali, matching and sequencing activities, multiple choice question games, creating nativity pictures, matching pairs games and jigsaws." Diwali - A short text : "Fill in the missing blanks using the words at the bottom of the page." Festivals of Light : Resource packs "around 4 Festivals of Light: Diwali, Hanukkah, Saint Lucia and theGunpowder Plot, from the Symbols Inclusion Project. This pack contains materials about four Festivals of Light. Diwali : 19 activities including stories, a play script, picture and vocabulary books and activities for individual and small group work. Hanukkah : 9 activities including the story of Hanukkah in a text and symbol supported versions, plus activities for individuals and small groups. Gunpowder Plot : 11 activities including stories, individual and groupwork. This includes a firework safety leaflet as well as a recipe and quiz. In each set there are a number of resources for whole class work, small groups and independent workers. There are symbol - supported stories, text onlystories, information sheets, recipes, crosswords, word searches and many more." "Discuss the stories behind Diwali and encourage pupils to talk or write about the characters involved. The Diwali writing activities and Diwali videos may help support this activity." "Build a calendar of religious dates and investigate the beliefs behind these festivals... The Diwali letter writing frame could be used to support this activity." Hindu, Sikh and Jain communities celebrate the 'festival of light'." and how Diwali is celebrated in India now. from "Ramayana: The Legend of Prince Rama (1992)"."